Disclaimer: This is not legal advice for your company to use in complying with the GDPR. It simply provides our interpretations of how it will affect people working in growth. This information is not the same as legal advice. We insist you consult an attorney for advice on applying the law to your specific circumstances. You may not rely on this post as legal advice, nor as a recommendation of any particular legal understanding. Too busy to read? Listen to the post instead. Just click the pink play button below. With the General Data Protection Regulation (GDPR) coming into effect in just 6 weeks, are the days of growth at any cost coming to an end? If you’re in growth, and not preparing for GDPR, you should be. Currently, many growth teams are violating the General Data Protection Regulation in multiple ways. And though it was approved by the European Parliament in April 2016, they’re unprepared to comply when it comes into effect on May 25, 2018. If you’re doing any of these things without explicit consent (defined below) from users, then it’s time to make some changes to your growth practices. In this post, we’ll talk about what you need to know to comply with GDPR across the 3 common growth activities mentioned above. Two Concepts Every Growth Person Must Understand about GDPR: "consent" and "legitimate interests"
But first, let’s walk through a few of the foundational principles from GDPR that are most important for growth. The days of relying on pre-ticked checkboxes, silence, or inactivity as implicit consent to track activities and send marketing communications are over. Not only that, but you’ll also need to offer users an easy and obvious way to withdraw previously given consent, and maintain documentation of the details of where, how and when you collected consent from your users. If GDPR governing bodies in EU member states or users ever bring a case against your company, you want to ensure the details of consent are documented, available, and defensible. But consent isn’t the only option for marketers, growth people, and service providers. “Legitimate interests” is another option that may provide an alternative to consent in certain cases. To evaluate legitimate interests as a grounds for personal data collection, define these three components on a case by case basis. Ensure you’re balancing your company’s interests with those of its users, as legitimate interests cannot be used to override users’ interests and fundamental rights. To dig deeper into understanding legitimate interests and when to apply them, the Data Protection Network’s guidance on legitimate interests is a useful resource for service providers. But ultimately, this is something you’ll need to work with your legal and compliance team to interpret and apply for your company’s specific circumstances. 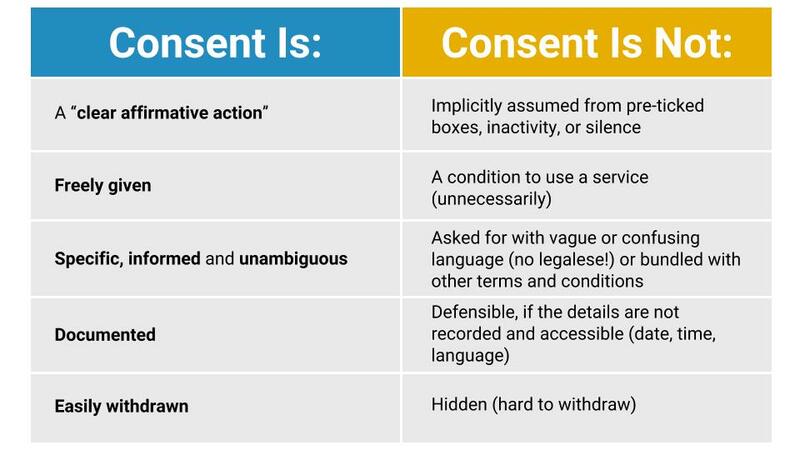 Now that we’ve established a basic understanding of consent and legitimate interests, let’s walk through the role they’ll play in the three growth activities we mentioned earlier. We’ll address each one individually below. Will GDPR Impact Web Tracking and Analytics? But still, many companies have scripts on their sites tracking user behavior without consent. And most tracking tools contain personally identifiable information (PII). It's no longer acceptable to bury tracking notices in the terms of service saying, ‘If you use our service, we will be tracking your behavior.’ When PII is being stored, you need to ask for explicit consent at the time you want to start collecting customer data. According to Recital 30 of the GDPR, even online identifiers (including cookies) and location data such as IP address are considered personal data. And any kind of personal data requires consent to be collected, processed and stored. To learn how other companies are approaching consent for tracking, I spoke with Andrew Michael, Experience Team Lead at Hotjar. Hotjar is an analytics and feedback service offering heatmaps, visitor recordings, and other feedback tools. Andrew currently manages GDPR compliance for marketing. “Our team is building new consent features to be ready for GDPR. For example, we have tools such as Heatmaps and Recordings that allow us to gather data about user behaviour on a website—but we introduced features that allow our users to suppress any PII from them. This means that Heatmaps and Recordings can still be used to understand visitor behavior, but there is no need to request consent because individual visitors are not being tracked. Data analytics vendors (data processors), like Hotjar and many others, are leading the charge to become GDPR compliant, as the stakes are especially high for them. What growth teams need to focus on now is not whether they will ask for cookie permissions and other forms of tracking consent, but how they will ask. If you’re collecting any personally identifiable data via cookies or scripts from analytics vendors like Hotjar, Mixpanel, Google Analytics and others, you will need to show a consent box when new users visit your site. No more soft opt-ins allowed, which means those cookie pop-ups that say something like “By using this site, you accept cookies,” or bundling cookie consents into your terms, will no longer cut it. There weren’t many GDPR compliant examples out in the wild yet (I bet that will change after May 25th), but below are a few examples I was able to dig up. Consent requirements like these will also have an impact downstream on our ability to personalize experiences for our users. So, What Does GDPR Mean for Personalization? When GDPR comes into effect, personalizing content without consent will be a no-no. According to this interpretation, companies that do user profiling, as described in Article 4.4 of the GDPR, will be required to ask for consent. This will impact the “big fish” most acutely - the ones who’ve pioneered and scaled personalization for growth - think Netflix, Amazon, Spotify, and Pinterest. Whether they actually do ask for consent, and how the Supervisory Authorities enforce the new privacy laws, remains to be seen. So, what do we do if consumers don’t opt in? First, we have an automatic suppression layer, that suppresses any form field, plus any number on a page greater than 9 digits (which may resemble a credit card or phone number), on any site that has Hotjar’s script installed. The data is suppressed on the end user’s side, so it never hits our servers. Second, we give customers the option to activate automatic on-page suppression of any number or email address found on any page of their website or app. Third, customers can tag specific elements they want to suppress, to make sure they aren’t sending personally identifiable information to our servers without consent. With this, it is impossible to link identifiable information back to an individual user’s session recording and heatmap data. Hotjar customers can still show surveys and polls to solicit feedback from visitors to their website or app, but they won’t be able to leverage the data for automation or other marketing activities—unless explicit and clear consent has been given through our feedback tools. In addition to tracking, analytics and personalization, the new rules of the GDPR will change how we approach email acquisition for marketing. When it comes to collecting and using email for marketing, again, consent is going to be the key to GDPR compliance. But many email marketers aren’t asking users for consent prior to collecting their email and other personal identifiable information and sensitive data. Let’s walk through each individually. Taking a user centric approach to email marketing is the best way to build trust with users, enhance data security, and survive in a post GDPR world. To do this bring privacy and consent forward into the strategy and design phase of your email acquisition program. Let’s walk through a few examples of different email capture forms to see what Privacy by Design is, and what it isn’t, in the world of email acquisition. This email marketing subscribe example from Sky is the antithesis of Privacy by Design. This was clearly designed to trick the user into “subscribing” to marketing emails, and it’s obviously not GDPR compliant. In contrast, below is a screenshot of the new account creation form used by the Data Protection Network (DPN). This form is a great example of Privacy by Design in action, applied to email acquisition. Your existing email list won’t be grandfathered in under GDPR. Come May 25th, you must be able to show proof of consent from each subscriber. If you already have proof of consent that is compliant with GDPR, you will not need to re-permission your subscribers. If you do not have evidence of consent from subscribers, you may need to scrub them from your list. Sending an email to ask for permission to send marketing emails is considered marketing, and may result in fines if you don't have evidence of consent. If you do have evidence of consent, you may want to send an email campaign asking existing subscribers to re-opt in. At Reforge, we periodically send re-permission campaigns to keep our email lists clean, make sure we’re sending to engaged subscribers who want to receive our content, and to protect email deliverability. Email preference centers will be key to staying within the confines of the GDPR. They give users an easy access way to understand and control the communications they receive from your company. Litmus does a great job with their email preference center and makes it very easy and obvious for people to withdraw consent. Is GDPR going to kill my referral program? Many fear that referral programs could be on their way out because there’s no way to get upfront consent from the people being referred. Fortunately, it may be possible to manage referrals in a compliant way. But it may require some changes to how you manage your referral data. Historically, one of the biggest problems with refer-a-friend programs has been that companies abuse them by creating a profile for the friend, storing their personal information, and sending marketing emails without approval. For obvious reasons, this is not GDPR compliant. To stay compliant, only send one referral message to the friend on the referrer’s behalf. Do this without storing any of the friend’s personal information or data, unless they’ve clearly consented to participate in the referral program. Do not create a profile for the friend or send any marketing messages to them. In the referral notification, let them know you will not store their data or market to them unless they choose to opt-in. “Resurrection is one of the areas most impacted by the GDPR. Currently, a lot of companies ask churning customers why they’re leaving - maybe they have a budget issue, or a project has finished. Then, based on their answers, the company will test resurrection strategies to win them back a few months later. As growth practitioners, what are we supposed to do when an entire growth strategy is wiped out? In this case, we need to turn back to activation and retention. They’ve always been the foundation for growth, but the “right to be forgotten” makes nailing both all the more critical. This means figuring out how to get users to actually create ingrained habits with our products during onboarding. It also means building churn prediction models and running re-engagement tests at the right time to intercept users before they quit our products for good. Why? Because once a user churns, it becomes much harder, if not impossible, to hold on to their data and re-engage them later under GDPR. What advice do you have for growth practitioners on next steps for GDPR compliance? We’ve put together a few resources below to help you navigate the process - a glossary of the key terms relevant for growth and a reading list of articles to learn more about the new data protection rules. Since there’s so little known yet about how the Supervisory Authorities will enforce GDPR, there’s no formula out there for becoming GDPR compliant. This post has probably brought up a lot of questions, but I hope that it has prompted you to ask more informed questions as you work closely with your legal and compliance teams to update how you approach data privacy and data security for your users. Good luck on your GDPR journey! Below are the definitions and principles of GDPR that are most important for growth and marketing - any emphasis is mine. And here is a complete list of definitions. Natural persons may be associated with online identifiers provided by their devices, applications, tools, and protocols, such as internet protocol addresses, cookie identifiers or other identifiers such as radio frequency identification tags. This may leave traces which, in particular when combined with unique identifiers and other information received by the servers, may be used to create profiles of the natural persons and identify them. A breach of security leading to the accidental or unlawful access to, destruction, misuse, etc. of personal data. A data controller or processor must designate a data protection officer in any case where their core activities consist of processing operations which, by virtue of their nature, their scope and/or their purposes, require regular and systematic monitoring of data subjects on a large scale; or the core activities of the controller or the processor consist of processing on a large scale of special categories of data pursuant to Article 9 and personal data relating to criminal convictions and offences referred to in Article 10. Do You Need to Worry about GDPR? How Does GDPR Affect Growth Marketing? It’s just legitimate interests, isn’t it? Consent & The Right to be Forgotten: How will the GDPR affect data capture?